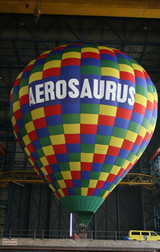 Due to a increase in demand together with the need to constantly be keeping the fleet up to date, Aerosaurus Balloons have taken delivery of a additional 317,000 cubic foot, 16 passenger, Hot Air Balloon, Registration G-CFFL. The balloon’s basket was made in Spain by Ultramagic, the burners in Italy by Bonanno and the envelope was made a bit closer to home, at Oswestry in Shropshire, by Lindstrad Hot Air Balloons. These companies were choosen as the major component suppliers owing to their worldwide reputations for high standards and quality. Subject to final post delivery checks the balloon will have its maiden test flight within the next 2 weeks and then will go into service operating from sites in Wiltshire, Cornwall, Devon, Dorset and Somerset. The main pilots will be Mandy Dickinson and Arthur Street who together have over 40 years experience worldwide of flying big balloons. Operating 7 days a week, 2 flights per balloon per day this latest addition to the fleet increases Aerosaurus Balloons capacity to 81 passengers who can take to the skies over the Westcountry on each slot, ranging from 2 passenger exclusives to 16 passengers at a time on the daily scheduled flights. The photo is of the balloon having its pre-delivery inspection, inflated inside one of the giant dry docks at Cammell Laird shipbuilders, Birkenhead.